This past March, the National Recreation and Park Association, in coordination with the office of Congressman Earl Blumenauer (D-Ore.), raised the rallying call to protect federal funding that supports many local public parks and recreation agencies nationwide. 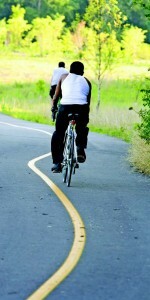 As the surface transportation reauthorization deadline loomed on March 31, the association asked for support of the Transportation Enhancements and the Recreational Trails Program component of the bill — which helps park and recreation agencies maintain recreational trails and continue community projects that increase access to and promote safe bicycling and walking. Both the Senate and House of Representatives launched their own bills, respectively S. 1813 and H.R. 4348, which offered different extensions. The Senate bill passed March 14 would provide a two-year, $109 billion extension. More controversial was the House bill, passed April 18, which offered only a short-term extension and was attached as a requirement for approval of the Keystone oil pipeline. On April 30, 2012, President Obama signed an extension of the current law. That extension extended the discussion through June 30, by which time the administration hoped to see a multiyear law in place that reauthorizes the act. The Obama administration, through the release of a written statement, vowed to veto the House’s initial bill if it passed. The extension to the end of the fiscal year, undermines the 2012-13 fiscal planning of states and localities as they undertake the execution of projects and programs essential to creating and keeping American workers in good-paying jobs, improving the nation’s surface transportation infrastructure and ensuring roadway safety. The administration also stated the bill would circumvent “a long-standing and proven process” for determining whether cross-border pipelines are in the national interest. It was noted the route of the pipeline had yet to be identified, which also meant there was no completed assessment of its potential impacts on health and safety, the economy, foreign policy, energy security and the environment. The Senate appointed 14 conferees to discuss differences between the S. 1813 and H.R. 4348 with the House’s appointed 33 conferees. In their initial meeting, May 8, it became obvious the Keystone pipeline would be a sticking point with commentators, speculating a deal would not be reached until the U.S. presidential election in November. Funding continues to be a roadblock as well. NRPA continues to watch Congress’s dealings closely with their own priorities being that communities continue to have safe multimodal modes of transportation that are conducive to recreational opportunities; this includes dedicated funding for walking and biking. MAP-21, a part of S. 1813, also includes a provision calling for two years of dedicated funding for the Land and Water Conversation Fund. It is an important program for cities and counties throughout the country since with the LWCF is the State Assistance program, which provides funding to local communities for capital park and recreation projects. The NRPA holds some concerns as the conference and debate continues, largely that the LWCF program is being portrayed only as a federal land acquisition program and that the LWCF provision will be misunderstood, causing the chance to enhance state and local parks to be lost. There is also a level of partisanship that has been lacking in past national transportation policy debates. “By providing two years of dedicated funding and simply addressing the distributions of funds to programs within the LWCF, Congress could make a significant impact in many communities in every state in the nation,” the NRPA stated. The NRPA states municipalities wishing to get involved and have their voices heard should write letters, sending them electronically, and emails to their congressional delegation with examples of local park and recreational deficits to highlight the difference additional LWCF Assistance funds would make. Municipalities should also work with park agencies and department directors to fine-tune talking points and align advocacy efforts. The message should be reinforced every time a federal official is seen. Adopting local resolutions that are shared with federal officials is also very effective. Be sure to invite members of Congress to visit local parks and recreational facilities for a better understanding of the many ways they serve their constituents. For further assistance, visit the NRPA Advocacy Center, www.NRPA.org/getinvolved, for resources. The NRPA’s advocacy team can also be reached through the website.